Toyota is all set to bring in the eighth generation Camry to India on 18th January. In India, this will be the fourth generation Camry to go on sale. The Camry Hybrid has already been on sale in the global market for a while; the one we will get here will be similar to the Thai-spec model. At the time of launch, Toyota will only introduce the Camry in the hybrid form. The Camry Hybrid is based on Toyota’s new global architecture, GA-K – the same one that also underpins the Lexus ES sedan. At the heart, the Camry Hybrid gets a 2.5-litre four-pot petrol motor that is good for 174bhp and 221Nm. This engine works in conjunction with a 116bhp electric motor resulting in a collective output of 205bhp. The Camry Hybrid also sports an all-new design that brings it in line with the rest of Toyota’s portfolio. While it continues to have the typically Japanese design traits, there’s no denying that it does look fresh. Just like the model it replaces, the new Camry Hybrid will continue to flaunt a blue tinge on the badges. Interior too has been reworked. It now comes fitted with a larger central touchscreen, head-up display and reclining rear seats. There’s also more space inside the cabin. Technically, in India, the Toyota Camry Hybrid competes only against the Honda Accord Hybrid but there are also the likes of the Volkswagen Passat and Skoda Superb in the segment. 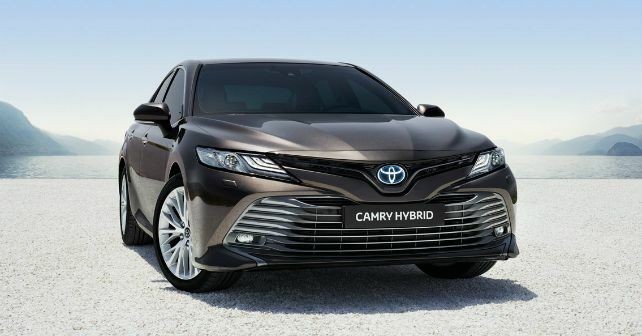 Expected to be priced around the Rs 40 lakh mark, the Camry Hybrid will also have to hold its own against luxury offerings like the Audi A3 and the Mercedes-Benz CLA.